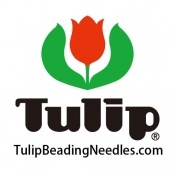 Tulip's fine beading awl has a silky and soft handle that feels comfortable to hold and reduces hand fatigue in extended use (as in knotting pearls). The fine beading awl has a strong tapered point fine enough to pick up 5-7 size 15 seed beads. The standard use a beading awl is to place precision knots between beads. The fine beading awl has additional uses. Use the beading awl to break out an errant bead in the beadwork. The fine point of the awl fits in any sized bead to reposition it in tight beadwork, for easier needle-access. Undoing beadwork stitches, even r.a.w. is easy with a fine beading awl. Tease open the peskiest of knots, even half-hitch knots, using the fine point of the awl to enter the knot and its increasing diameter to open the knot for untangling. The fine beading awl will make you a "thread whisperer".